Animal Planet » Programs » Predation! When it comes to collecting accolades for their hunting prowess, the zebra and praying mantis might not sound like worthy contenders. However, recent findings have shown that these creatures deserve to stand next to the lion, vulture and hyena when it comes to the predator roll call. In five unprecedented short stories, shot in striking cinematography, find out what their typical hunting modus operandi is when PREDATION! premieres this month. Predation is part of the chain of life. It is a merciless process both for the predator and its prey whose destinies and future evolutions are inextricably linked. From the African savannah to the European swamps, from a predator's killing quest to a prey's fatal final moments, this collection of five world-class specials explores predation in its different aspects and highlights its prominent role in the web of life. From underrated predators to those top of the food chain, PREDATION! turns the spotlight on deadly predators who are out there prowling on a daily basis. All of the featured creatures are extremely effective, though their skills as hunters are not wholly understood much to the disadvantage of their prey. One thing is for sure though: be it evolutionary adaptation or simply their ability to get what they need in order to survive, all of these predators are expert killers. 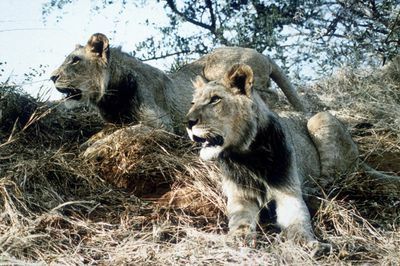 The Predator's Story follows the trials of two young, twin male lions thrown out of home by their father. Scavenging for carcasses and dodging the trampling attacks of elephants, rhinoceros and buffaloes, they are anything but kings of beasts. However, hunger is an excellent teacher and within a year they will have reached the status of dominant predators, recognised and feared in their lakeside territory. Praying mantises, with some reaching the giant size of 20 centimeters, are grim predators able to overwhelm prey much larger than themselves. They may not spit acid like the nightmarish monsters in alien movies, but any victim coming within range of their razor-sharp, needle-studded claws stand little chance of survival. 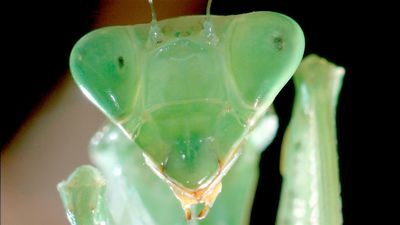 This spectacular episode shows how mantises live, reproduce and die. When a wildebeest dies, lions feed on its carcass for days. Soon after, other scavengers such as vultures and hyenas come for their share. Over a period of five months, using the latest techniques of macro and aerial photography, this episode follows the life and death of wildebeest, to reveal the world of African scavengers. It also features extraordinary footage of the largest wildebeest migration ever, provoked by an extreme drought. Welcome to a strange territory, one where man isn't welcome and enters with the greatest unease: the swamps. This aquatic world is home to numerous species that replay the eternal game of life and death in which the hunter so easily becomes the hunted. Witness a world where you never know if its sunny or pitch dark - one that is perfect for predators. Shot on location in the Masai Mara, Kenya, this award-winning episode takes a close look at the zebra evolution, as well as its social behaviour and survival methods. Zebras: Painted Horses follows a herd of zebras through the perils and rewards of the Great Migration, complete with spectacular footage of their survival strategies.